One of the toughest people to face in the workplace is a know it all. Even tougher than that is if the biggest know it all in the office is the leader! So what is it about being a know it all that makes it so dangerous? Workplace Psychology gives us an insight from a study by Lombardo & Eichinger stating. Being a know it all can definitely derail team motivation, and thus in turn derail individual and organizational success. So what are some symptoms that you’re leader (or even you!) could be acting like a know it all? I’d like to give seven. 1. You don’t admit to your mistakes. 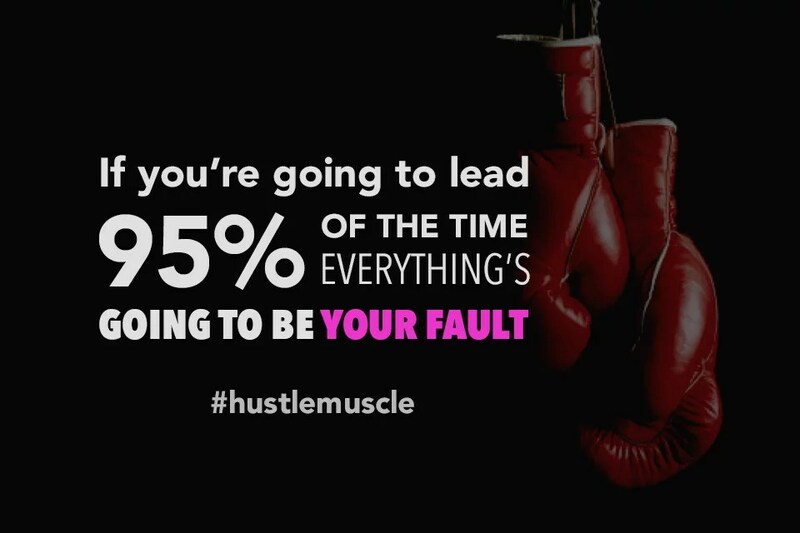 In my book, Hustle Muscle, I talk about leadership, and how a large chunk of leadership is admitting to mistakes. And truth be told? As a leader, most of the mistakes that happen will be on us. Why? Because we are to be responsible for the output of the people under our leadership. Being a leader is more about being responsible than being right. When we try to justify our actions by saying “my team couldn’t hit the quota because there were some people that did not perform.”, as a leader that’s still on you. Why did those people fail to perform? Maybe because there was no direction given, or the direction was not clear. Or if those people are the lazy unproductive types, what are they still doing on your team? How are you to act on that as a leader? 2. People seem disinterested when listening to you. I had a client who once told me with such disdain how she could not swallow the idea of how inattentive to ideas and instructions given to them. After talking to the team, it was later found out that the things that were passed on to the team were always filled with “I did this” and “I did that” and “You shouldn’t do this”. Basically the team was ruled by a know it all. Thankfully enough that client realized the dismay of her actions long before it caused any more trouble. That company is now run by attentive and motivated people. When it’s hard to get people to listen, it’s probably because they don’t hear anything worth listening to. As leaders, we are first to offer value to the team we lead before we demand value in return. 3. Your staff find it easier to talk to other supervisors. I once joined a company that had multiple partners. I was working directly under the Creative Director, who had two other partners. As a follower, I found it hard to follow my direct supervisor because he was always throwing blame at our team. As a result, we found it easier to direct our concerns to his other partner who did not have any coordination with our department. The partners were confused about what to do because they couldn’t understand what was going on. Often, when this happens it is a cry for help to the leaders that the person that is directly overseeing them is being a hard case. 4. People come late to your meetings. Don’t get me wrong. I’m not saying that all people who come late think you’re a know it all. People can come late for various reasons- some bad, some worse. But many times people find it pointless to attend the meeting of a know-it-all because of the perceived arrogance that is displayed and the lack of team input and effort shown. There’s no point in holding a meeting where the opinions of others do not matter. 5. You use “I” more often that you use “We”. I really believe in what Luke 6:45 says, “For the mouth speaks what the heart is full of.” When it’s hard to replace “I think” with “What does everyone think?”, then it’s time we considered changing our leadership style. Knowing as much as you can is important when being a leader. That’s why we talk about it, and read about leadership. But our knowledge will never be more valuable than relationships and people. Like the old cliche says “people don’t care how much you know until they know how much you care.